Browse > Home / Hot Topics / Tech Tips and Industry News! What More Could You Ask For?! Tech Tips and Industry News! What More Could You Ask For?! This week there is a lot of news but we thought you might like to start off with something we might do more of in coming issues. First, go to this Google invented website: Talk to Books. Next, click the “dashed ground sign” to filter your searches, and we used “Current Events”; and then hit “GO”. We won’t list what we found but we strongly suggest you try it out. There seemed to be no end the IFEC the book references we found; and if you can’t use it for just about anything you are researching, well, at least you know about it. Further, your kids and friends in school just might be able to do better information search retrievals looking for their data! Cool! And now, on with the latest aviation news. CENTECH and Thales launch AI@CENTECH to boost start-ups to success in Artificial Intelligence. To support the development of start-ups working in the field of Artificial Intelligence, Thales has teamed with CENTECH, Québec’s largest start-up incubator, created by the École de Technologie Supérieure in Montreal. This strategic partnership will provide start-ups with access to the Thales Group’s technological expertise, business insights and digital capabilities that will take their concepts and prototypes to the next level of maturity. Thales has invested close to 7 billion euros in digital technologies since 2014, including the planned acquisition of Gemalto. The Air Navigation Service Provider for Papua New Guinea, PNG Air Services Limited, has completed a transition to the TopSky-ATC system provided by Thales. This transition represents a jump from a 30 year old paper strip system to a state-of-the-art electronic system, helping to reduce air traffic controller workload and increase safety throughout the airspace. PNGASL are responsible for the safe movement of more than 50,000 flights per year through their airspace, which includes many high level overflights. The deployment by Thales includes a main operational system and combined backup & training system. The TopSky-ATC system provides the controllers with modernized flight data processing, multi sensor surveillance processing and advanced alerting functions. Seamless coordination between neighboring states allows safe transition of flights to and from Papua New Guinea. 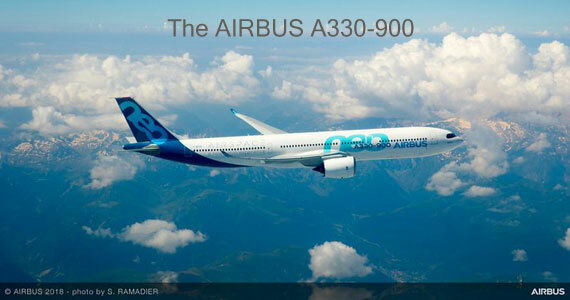 The European Aviation Safety Agency (EASA) has approved the A330-900 for ETOPS (Extended-range Twin engine aircraft Operations) “beyond 180 minutes” diversion time. This significant achievement means that operators of the A330neo, which is powered by Rolls-Royce Trent 7000 engines, will benefit from the most efficient, reliable and direct long-range routings. The approval, which includes ETOPS 180 min. capability in the aircraft’s basic specification, now also includes the option for “ETOPS 285 min.” This extends the potential air diversion distance to around 2,000nm. The U.S. FAA’s respective ETOPS certification is expected soon. Airbus has launched a global competition in quantum computing, inviting experts to propose and develop solutions, for complex optimization and modelisation across the full aircraft life-cycle, using newly available computing capabilities. The Airbus Quantum Computing Challenge (AQCC) aims to take science out of the lab and into industry, by applying newly-available computing capabilities to real-life industrial cases. With traditional computers approaching their limits, the quantum computer promises to deliver a new level of computational power. As an active user of High Performance Computing (HPC), Airbus is already extending current capacity by integrating and leveraging quantum technologies in fields such as route optimisation and satellite imagery. Through the challenge Airbus is looking to further explore solutions that quantum technologies can bring through the sharing of in-house and external knowledge, data and expertise. Five distinct challenges have been identified in the flight physics domain that have an impact on all aspects of Airbus’ business, from design and operations, to airline revenue streams. With varying degrees of complexity, the statements range from the simple optimization of aircraft climb to the more complex optimization of wing-box design. Open to post-graduate students, PhDs, academics, researchers, start-ups and professionals in the field of quantum computing, individuals or teams will compete for hardware access and for the opportunity to mature their ideas for industrialisation, working collaboratively with Airbus industry experts. The AQCC will run throughout 2019. Boeing last week successfully completed the first test flight of its autonomous passenger air vehicle (PAV) prototype in Manassas, Virginia. Boeing NeXt, which leads the company’s urban air mobility efforts, utilized Boeing subsidiary Aurora Flight Sciences to design and develop the electric vertical takeoff and landing (eVTOL) aircraft and will continue testing to advance the safety and reliability of on-demand autonomous air transportation. The PAV prototype completed a controlled takeoff, hover and landing during the flight, which tested the vehicle’s autonomous functions and ground control systems. Future flights will test forward, wing-borne flight, as well as the transition phase between vertical and forward-flight modes. This transition phase is typically the most significant engineering challenge for any high-speed VTOL aircraft. Powered by an electric propulsion system, the PAV prototype is designed for fully autonomous flight from takeoff to landing, with a range of up to 50 miles (80.47 kilometers). Measuring 30 feet (9.14 meters) long and 28 feet (8.53 meters) wide, its advanced airframe integrates the propulsion and wing systems to achieve efficient hover and forward flight. The test flight represents the latest milestone for Boeing NeXt. The division works with regulatory agencies and industry partners to lead the responsible introduction of a new mobility ecosystem and ensure a future where autonomous and piloted air vehicles safely coexist. In addition to the PAV, the Boeing NeXt portfolio includes an unmanned fully electric cargo air vehicle (CAV) designed to transport up to 500 pounds (226.80 kilograms) and other urban, regional and global mobility platforms. The CAV completed its first indoor flight last year and will transition to outdoor flight testing in 2019. And, here is the flight of the PAV in Manassas, Va.
Self-flying aircraft an overlooked opportunity in autonomous transport – Axios It’s coming?